Egyptian tycoon Naguib Sawiris made billions of dollars from a global telecommunications empire that operated in authoritarian states from Zimbabwe to Pakistan. Now he is being dealt a potentially painful setback by one of the global economy’s biggest pariahs: North Korea. Mr. Sawiris’s Orascom Telecom Media and Technology Holding SAE built a highly profitable mobile phone business with around 3 million customers in the isolated nation, as cellphones became popular with wealthier North Koreans and the state eased restrictions on communications. The business earned around $270 million before taxes and depreciation on $344 million in revenue in 2014. But in the last few years, a state-run competitor emerged in North Korea, and Cairo-based Orascom hit problems trying to repatriate profits. Orascom said in a November filing in Egypt it had lost control of its 75%-owned North Korean venture, Koryolink, and struck the venture from its balance sheet, removing hundreds of millions of dollars in assets. Mr. Sawiris, chief executive officer of both Orascom and the North Korean venture, is now trying to negotiate a solution. “We are still hopeful that we will be able to resolve all pending issues to continue this successful journey,” he said in a statement accompanying the filing. Orascom’s auditor, however, cited the “futility of negotiation” with North Korea over Koryolink’s assets, which the company said were worth $832 million at the end of June, including cash in North Korean won worth $653 million at the official exchange rate. 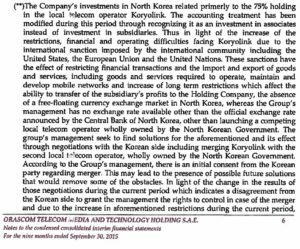 Koryolink, which now accounts for 85% of Orascom’s revenue and profit, says it hasn’t been able to send any funds out of North Korea in 2015 due to local currency controls and international sanctions targeting Pyongyang’s nuclear weapons program. Mr. Sawiris didn’t respond to requests for comment and Orascom declined to make him available for interview. A spokesman for Orascom reiterated the company’s public statements and didn’t respond to further questions. North Korea hasn’t referred to the dispute in its state media and relevant officials couldn’t be reached for comment. How North Korea resolves the dispute could bear on its plans to cultivate foreign investment to develop the moribund economy. In recent years, Pyongyang has created more than 20 special economic zones for investors and announced local regulations intended to reassure foreigners. The setback for Mr. Sawiris, 61 years old, underscores the risk of doing business in North Korea, where foreign firms have complained that property and profits have been appropriated by the government. In 2012, a Chinese mining company said North Korea arbitrarily took over its metal-processing facility in the country. Pyongyang in turn publicly accused the firm of failing to meet investment commitments. Orascom says talks with the North Korean government to resolve its difficulties have included a possible merger with the rival carrier, Byol. However, North Korea has indicated it wouldn’t give Orascom management control of the combined entity and those talks have stalled, the Egyptian company said in November board minutes, reviewed by The Wall Street Journal. 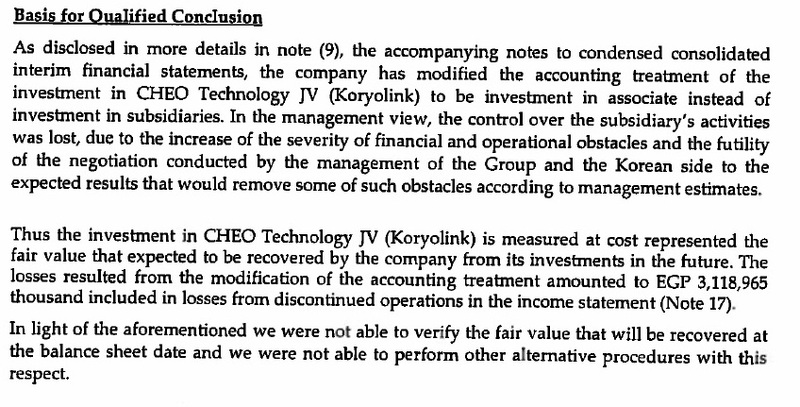 As a result, “control over Koryolink’s activities was lost” according to accounting rules, the company said in its latest earnings report. Few companies venture into North Korea. But for the outspoken Mr. Sawiris—who describes himself as a “freedom fighter” on his verified Twitter profile, and who has experience operating in difficult environments—a bet on the hermit kingdom made sense. Since 1997, Orascom has built and run mobile networks in more than 20 countries across Africa, the Middle East and the Indian subcontinent. Its strategy: Load up on debt to build networks quickly in risky markets with little or no infrastructure, betting on rapid growth and strong returns, then sell when the market matures and more players materialize. Orascom operated in many politically unstable nations such as Yemen and Bangladesh. In most cases, the gamble paid off. In 2003, Orascom paid $5 million for one of Iraq’s first mobile network licenses. Its local partner faced kidnappings of staff and attacks on property from insurgents, but in 2007 Orascom sold its Iraq operations for $1.2 billion to a Kuwaiti company. There have been some setbacks. Orascom’s joint venture in Syria with a company run by a cousin of President Bashar al-Assad fell apart in 2002 when a Syrian court handed the Egyptian company’s share of the venture to the local partner. In 2011, Mr. Sawiris sold most of his telecommunications assets to Russian mobile operator VimpelCom Ltd. in a deal worth $6 billion. Koryolink was one of the few assets he kept. Orascom’s operations in North Korea began when the country awarded Koryolink the rights to operate its only mobile network from late 2008 through the end of 2012. North Korea had scrapped an earlier project in the country with a Thai firm in 2004, because of fears the network was vulnerable to spies. Koryolink started with around 18 foreign staff based at a hotel in the capital city, according to Madani Hozaien, Koryolink’s chief financial officer from late 2008 to mid-2009. North Korea’s tight restrictions on travel made it difficult to manage network facilities and deals with local counterparts were hard to put together, he said. “Once we had an agreement with one group, another team would appear and we’d have to start again,” he said. Ihab Shafik, a human resources and administration manager for Koryolink from 2009 to 2012, said the company’s North Korean staff sometimes operated independently. “They built GSM [Global System for Mobile communications] towers without informing us and we discovered them later,” he said. North Korean authorities gradually from 2008 allowed most members of the public to sign up for mobile service, although they can only make domestic calls and don’t have Internet access. While mobile phones remain very expensive for most North Koreans, visitors to Pyongyang report that they’re a common sight. Defectors from the country say they have become increasingly important information tools for traders as North Korea’s unofficial market economy has grown in recent years. North Korea state media has even touted the country’s own smartphone, although it is generally considered a rebranded Chinese model. 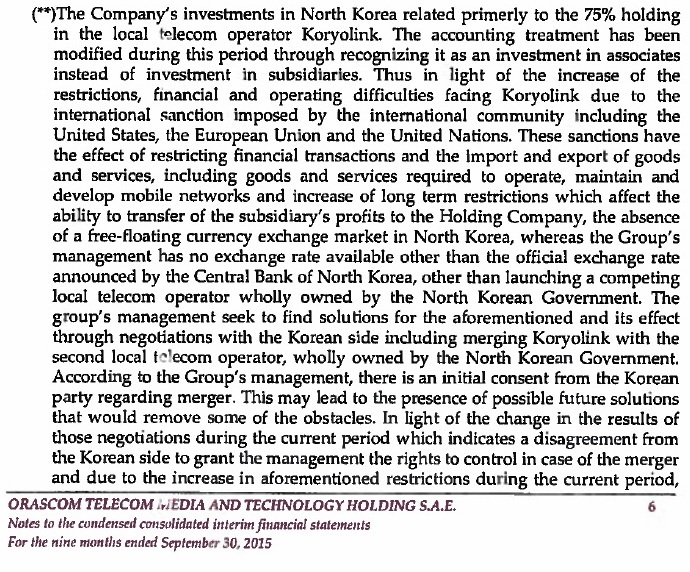 Orascom’s problems in North Korea appear to have built during the final year of its exclusivity clause in 2012. Koryolink’s annual report for the year noted “restrictions on cash transfers from local currency” in explaining a $272 million cash balance held inside the country, that more than doubled to June 30. The company’s board meeting to ratify first quarter results in 2015 was postponed by over a month “due to the delay of the negotiations with the North Korean side to solve the problems arising out of the transfer of dividends, the currency exchange rates and the operational problems that has recently emerged,” minutes from the meeting reviewed by the Journal said. Orascom’s share price fell sharply on the Egyptian stock exchange after the company announced it was removing the North Korean operations from its consolidated earnings. The price has risen recently after Orascom announced plans to buy two financial companies, part of Mr. Sawiris’ effort to move away from telecommunications. Experts on the North Korean economy say Orascom’s difficulty in repatriating funds is largely due to North Korea’s inability or reluctance to convert Koryolink’s cash to foreign currency from North Korean won at the official exchange rate. North Korea suffers constant shortages of foreign exchange and its own currency is worthless outside its borders. In 2013, Orascom also was caught up in U.S. sanctions on North Korea, when a bank it had set up with a North Korean partner, which Koryolink uses for financial transactions, was barred from accessing the U.S. financial system. Here is additional coverage in the Chosun Ilbo. 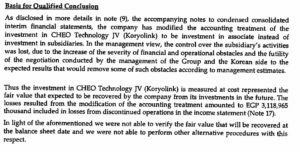 UPDATE 1 (2015-12-11): Orascom CEO claims to still control KoryoLink, but cannot obtain hard currency or get it out of the country. ORIGINAL POST (2015-11-20): Martyn Williams broke the story here. Orascom’s efforts to get its profits out of North Korea have been unsuccessful, partially because of international sanctions imposed on the country but mainly by the government’s refusal to let the money go. To transfer money out of North Korea, Orascom needs permission from the government and it hasn’t been granted, despite it being a partner in the joint venture. The government hasn’t acted because it can’t afford to. The profits are held in North Korean won, but the currency isn’t traded internationally and the government’s official rate is set artificially high, at 100 won to the U.S. dollar. At that rate, Orascon’s holding at the end of last year was worth $585 million. But at the black market exchange rate, which is effectively the real value of the currency in North Korea, the cash is worth only $7.2 million. And therein lies the problem. The government can’t afford to pay the money at the official rate, and it can’t be seen to officially recognize the black market rate. So the two sides have spent months locked in talks about what to do. The issue came to light in an auditor’s report in June, and a month later Orascom dropped a bombshell: It said the North Korean government — supposedly its close partner — had set up a second carrier to compete with Koryolink. What’s more, the North Korean government has apparently proposed that it be the majority partner in any new venture that’s formed. This comes after Orascom discovered that North Korea was starting a competitor to Koryolink called Byol, and then began discussions about merging it with Koryolink, thus presumably extracting even more money from Orascom. Byol (별) translates to English as “Star”. Here is the OTMT financial report which explains the company’s position (PDF). A small correction needs to be added to the OTMT report, the Central Bank does not set the official exchange rate. That is set by the Foreign Trade Bank. As Marcus Noland and I have pointed out, North Korea needs a big FDI win to inspire more large-scale foreign investment and modernize its investment regulatory framework, but debacles like this, Xiyang, and the KIC (referring here to the fact that it was too entangled in political risk to be a reliable investment without official subsidies and guarantees) reinforce the view that the DPRK is still too risky to become an attractive investment hub–and this excludes additional problems owing to the country’s weapons programs and human rights abuses. This entry was posted on Friday, November 20th, 2015 at 8:48 am and is filed under Cell phones, Central Bank, Communications, Economic reform, Foreign direct investment, Foreign Trade Bank, Joint Ventures, Orascom Telecom Holding. You can follow any responses to this entry through the RSS 2.0 feed. Both comments and pings are currently closed.